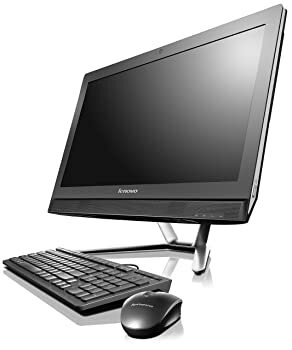 Lenovo C470 21.5" Full HD Touch All in One PC intel Core i3-4010U 8 GB RAM 1 TB. 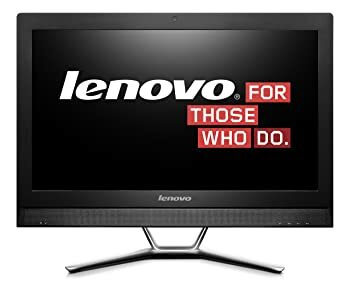 The 21.5-inch Lenovo C470 All-in-One PC reshapes the affordable home computer, combining a smart space-saving design with powerful 4th generation Intel Core i3-4010U processor technology and integrated graphics. This all-in-one PC features a 21.5-inch HD (1920 x 1080) 16:9 widescreen display, 8 GB DDR3 memory and 1 TB HDD storage. Tool-free storage and memory expansion. Dolby Advanced Audio v2 audio tools and integrated stereo speakers. Easy access to multiple ports. Features a 21.5-inch HD (1920 x 1080) 16:9 widescreen display. Expand the storage up to 1 TB HDD, and the memory up to 8 GB (2x DIMM) thanks to the sliding back cover. This easy expansion doesn't require any tools or complicated work over exposed components. 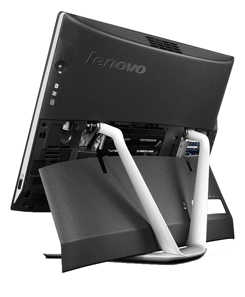 The Lenovo C470 features a powerful 4th generation Intel Core i3-4010U processor and integrated Intel HD graphics. When top-of-the-line performance is needed for the most demanding of tasks, an Intel Core processor is an ideal choice. With the Dolby Advanced Audio v2 audio tools, you can experience riveting surround sound on your PC with the integrated stereo speakers. Dolby Advanced Audio v2 enables your laptop to deliver a crisp, clear cinematic sound experience through the built-in stereo speakers. 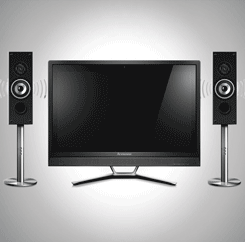 Play your music louder with less distortion and customise your PC audio settings. The Lenovo C470 features a CyberLink PowerDVD multi-media player, plus CyberLink Power2Go disc burner. This DVD software suite means you can watch DVDs and burn DVD disks straight out of the box. Take your web chats to another level thanks to the built-in HD webcam. Your friends and family will be able to see you in clear 720p resolution, which means the picture will look good even on a large TV screen. The HD webcam also has enhanced low light capabilities, which means you'll always be looking your best whatever the lighting conditions. The Lenovo C470 comes with multiple wireless connection options. The built-in 802.11 b/g/n Wi-Fi adapter will allow you to enjoy reliable connections to the internet, while Bluetooth 4.0 makes it easier to connect and share files with other devices. Transfer your files from your mobile device to your desktop quickly and easily with the built-in six-in-one card reader. The card reader is easily accessible on the front of the desktop and supports MS, MS Pro, SD, SDHC, MMC and MMC Plus. By connecting the Lenovo C470 to a compatible USB 3.0 device, such as an external drive, 3.0 can offer up to 10 times faster transfer rates than standard USB 2.0. This means that files and folders that took hours to transfer just take minutes and you can move whole albums to and from your PC in just a few seconds, saving you time and making your media much more portable. 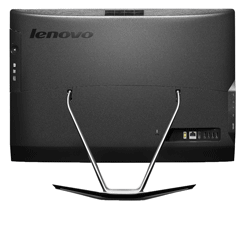 The Lenovo C470 comes with one USB 3.0 and two USB 2.0 ports. Lenovo Assistant is an easy to use interface to organise your favourites, clean up history -- including passwords -- and junk files. Lenovo Assistant also helps manage the PCs network connections and energy consumption. Lenovo Rescue System offers a simple and quick way to back-up and restore your data and recover system files before entering Windows. You can back-up operating system data, plus media and productivity files to an internal or external hard drives. Hit F12 during Windows boot to access, or access normally through Windows Metro. The AccuType keyboard is designed to help easy cleaning and maintenance and avoid the accumulation of dust and crumbs over time. The finger-friendly curved key shape and ergonomic spacebar will work together to make it easier to type and reduce the number of typos, wherever you find yourself working. Type - Lenovo has set a benchmark for the industry and added simplified controls for Windows 8.1. These award-winning designs are used across the Lenovo ranges, helping you to enjoy comfortable, convenient keyboard input wherever you are. Lenovo Cloud - Imagine your files, everywhere. Lenovo's online storage and cloud utilities allow you the freedom to choose your device and location. With 5 GB of free storage, you'll be able to secure and access your files wherever you are, on whatever machine you find yourself on. Lenovo Content - Discover all the amazing things you can do with exclusive tools from Lenovo. Learn how to get the most from your PC with Lenovo Companion or monitor your system performance with Lenovo Support. Lenovo keeps you up to date and delivers music, game and video content you can't get from anyone else.